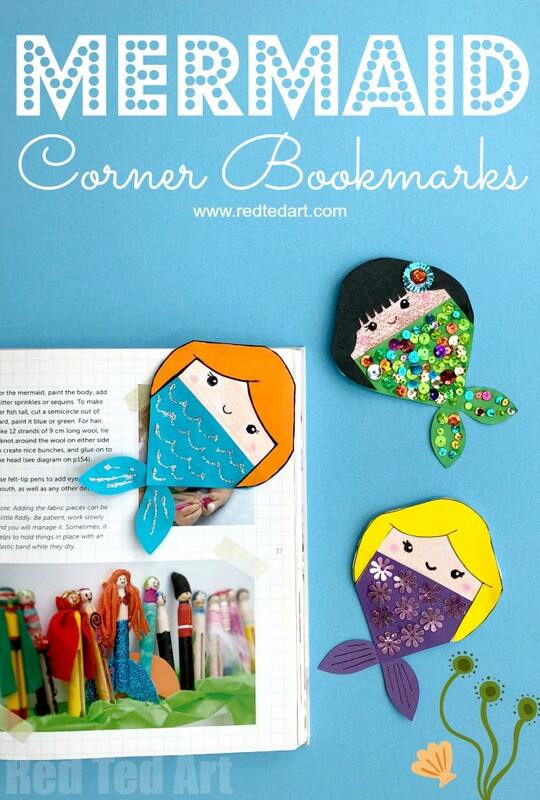 It really was only a matter of time before we made a Mermaid Corner Bookmark here on Red Ted Art. 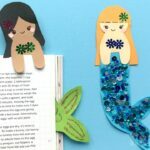 As you know, we do rather love our corner bookmark designs and have literally over a 100 for you to choose from.. but one glaringly obvious missing design was this darling little Mermaid Bookmark Corner. 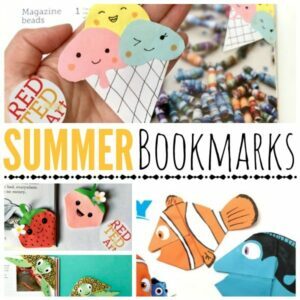 We have Unicorn Corner Bookmarks.. and Mermaid Hug Book Bookmarks (I love these by the way, you simply have to take a look) and finally.. 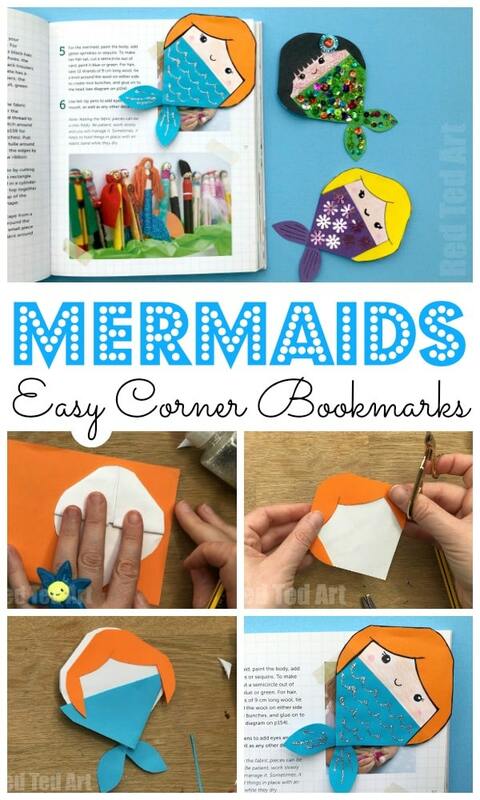 I managed to figure out what a Mermaid Corner Bookmark should look like. 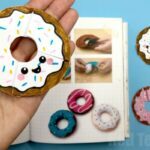 We have a whole collection of magical Mermaid Craft Ideas coming for you soon! 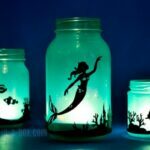 In the meantime, I have listed some of my favourite DIY Mermaid Crafts and Ideas below! Watch our detailed video how to, or follow the written steps below! 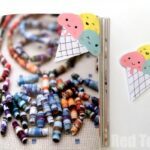 As with all our bookmarks, begin by making a basic corner bookmark. 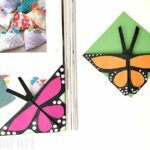 You can watch the video above or follow these Step By Step Origami Bookmark Instructions here. 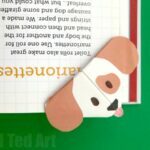 Next trim your top on and sides of the corner bookmark. 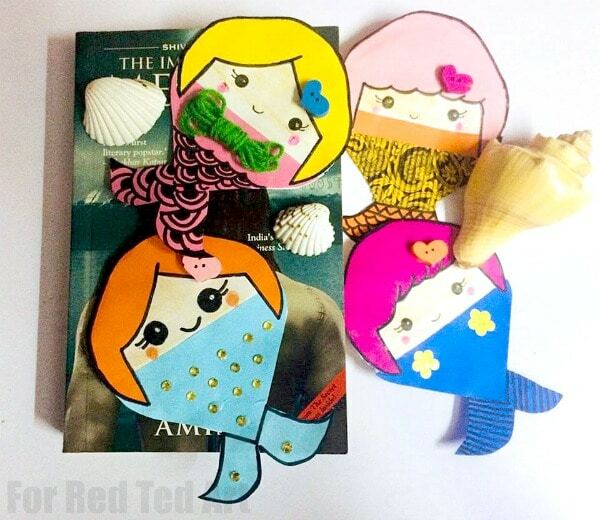 Trace an outline of your mermaids head onto the coloured paper designed for the mermaid bookmark’s hair. 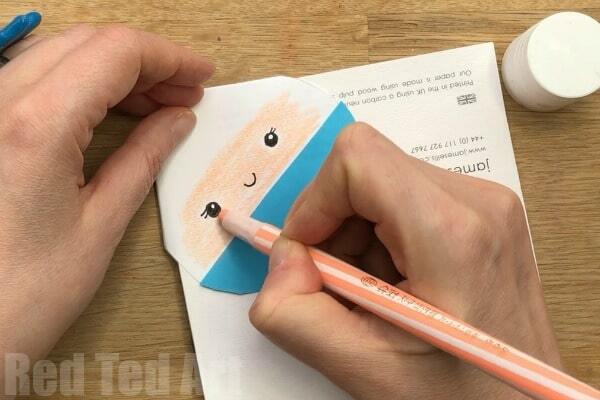 Shape to suit a face. 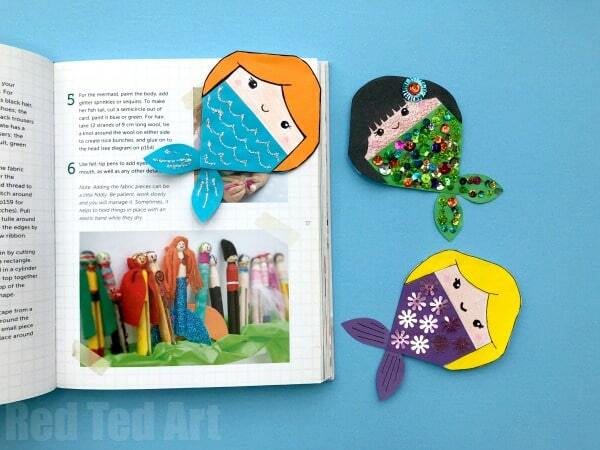 Trace the bottom half of the bookmark in the coloure paper chosen for the mermaids tail. 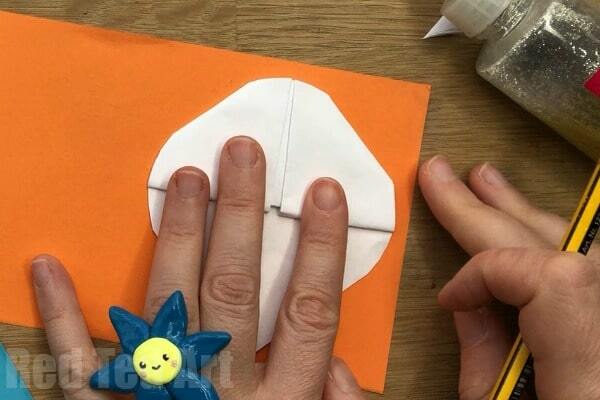 Cut out a triangle. 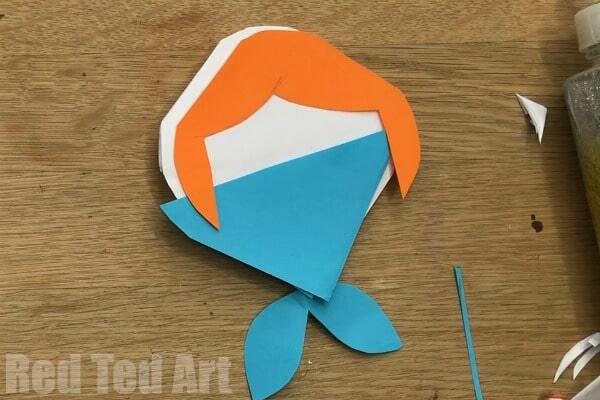 Then cut out two fins. Make sure all your pieces fit together and there is enough space for the face. Add the mermaid’s facial details and skin colour. 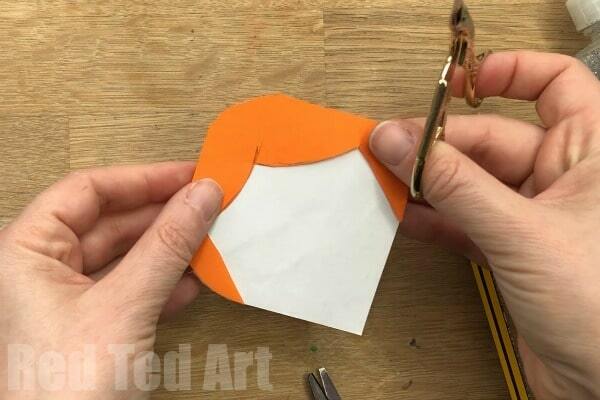 Glue down the hair and fin. 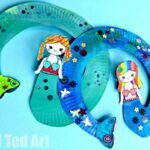 Finally, decorate the Mermaid’s fin with glitter glue and sequence (optional of course!). Broken Dolls? Dispair not.. take some moldable glue and turn them into mermaids.. these recycled doll mermaids have been a favourite at bath time for weeks! 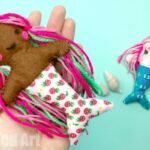 Many Moons ago, the kids and I made about feels like about 100 of these Wooden Peg Mermaid Dolls – oh how we loved to make these? The link for the doll-turned-mermaid is not listed. Could you provide That, please?